As barbecue season approaches, customers might find themselves wondering if the ground beef they are buying to throw on the grill is free from so-called "pink slime," a widely debated filler used in some ground beef. But local meat managers say they don't use the filler at all. "We don't carry that," said Main Street Market Meat Manager Alfredo Mejorado. "We're still just old-fashioned. We grind it all at the store." "Pink slime" is a pejorative term for a product called "lean finely textured beef," a filler product made from beef trimmings and added to certain types of ground beef to reduce fat content. "When you trim meat, there's meat and fat left over," said Atkinsons' Meat Manager Mike Woodall. "Instead of throwing it away, [beef producers] found a way to separate the meat from the fat." According to multiple sources, the trimmings are heated and spun in a centrifuge, where the fat melts and runs off. The remaining meat is then treated with a solution of ammonia and water (ammonia hydroxide) to kill E. coli and salmonella bacteria, and mixed into ground beef—usually in an industrial setting, such as in meat for school lunches or prisons. Much of it is produced by a South Dakota-based company called Beef Products Inc., which invented the process in 2001 as a way to make a safer hamburger. Pink slime came into the media spotlight in a 2009 New York Times article and again in March 2012, when ABC evening news revealed that much of the ground beef sold in supermarkets contains the filler. Woodall said that's not true in the Wood River Valley, and that Atkinsons' does not sell any beef with the lean finely textured beef mixed in. "When we do ours, we take a whole piece of chuck or a round or sirloin and we cut it up and grind it solid like that," he said. "Nothing is added." Woodall said the practice is more common in large packing houses, where multiple animals are slaughtered and have their meat ground together with the filler, which is typically frozen and used in blocks as needed. But especially with organic beef, Atkinsons' generally gets its meat from one animal that is processed at the store. Mejorado said the same is true of Main Street Market, though many larger "corporate" chains might have a different story. Albertsons' Hailey meat manager declined to comment, but a corporate customer service representative offered some information. "Albertsons is committed to delivering safe, high-quality products for our customers," she said, reading from a printed statement from the company. "We do not add it to products ground at our retail stores, but it is often used by our ground beef suppliers." The spokeswoman said she did not have information about how to tell the difference between beef with the filler and beef without when shopping at an Albertsons location. Woodall said he believes the filler is safe, though unappetizing looking in its unblended form. 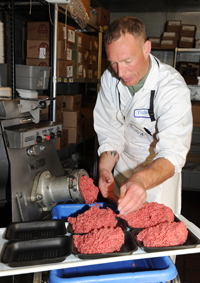 Lean finely textured beef was approved by the U.S. Department of Agriculture in 2001, and in 2007 the agency declared it was so safe that it was exempted from routine testing of hamburger meat. Woodall compared eating beef with the filler to eating farmed salmon that has been colored pink to mimic the color of salmon that feeds on shrimp and has that hue naturally. "Would I want to eat it?" Woodall said. "No. [But] it's not bad for you. It's one of those things, when people find out, it's like 'Oh, yuck.'"